Interior trends in 2019 are all about sustainability. There’s a huge emphasis on natural materials, artisanal textures and versatile fabrics and designs that are classic, timeless and made to treasure. Which is why I’m excited to introduce you to our “Desert Winds” collection of tactile throws and cushion covers. Handcrafted on traditional pit looms in the Thar Desert of Rajasthan, this collection is handcrafted by an NGO that empowers a community of weavers through sustainable livelihoods, educational programmes and gender empowerment. This is artisanal home decor for timeless, slow living that add textural accents to your home with striking geometric patterns, handwoven textures and colours that go from minimal monochrome to vibrant shades for a free spirited charm. Take a look at how our new collection of handwoven throws and cushion covers could inspire your living spaces. Our Spring Summer 19 collection is about celebrating the artisan. Slowly made, loomed throws that showcase the skill and distinctive geometric designs of Western Rajasthan. Woven textiles are key this season and our throws perfectly combine striking embellishments of Kashida stitch painstakingly handcrafted into the warp. Kashida which means embroidery in hindi, has a rich history that started as a way of poorer communities recycling their clothes by embellishing them with embroidery. This year’s trends are a nod towards native motifs, tribal patterns and a nomadic feel. But did you know our throws have their origins with the nomadic people of Rajasthan? Originally called Pattu’s - our throws were thick shawls worn by nomads to keep out of the bitter winds and protect against the harsh and inhospitable conditions of The Great Thar Desert. Pretty cool right? But how can you stylishly add these pieces to your home without it looking like you’ve just got back from a backpacking trip? The trick is to balance bright bursts of colour and pattern with soft tonal colours of the room. For example, in the image above, you can see the white sideboard softens the throw which is placed on a blank canvas of white bedding. The plain furniture and plain cushions contrast well with the patterned cushion and white rug adds softness and texture. Looking at it visually its balanced and cohesive. You could also drape a throw over a piece of furniture for that touch-me artisan look or at the bottom of your bed for a colourful focal point that works well with matching or mismatched cushions. Great for updating a room, the geometric patterns and tactile fringing add versatility. The throws also double up as rugs. Have fun with the natural weave of patterns by layering rugs by a fireplace, around seating areas or a bedroom. Ideal for creating eye-catching interest from the ground - up. Available in three sizes, you can use the smallest as a throw and the largest as a rug. 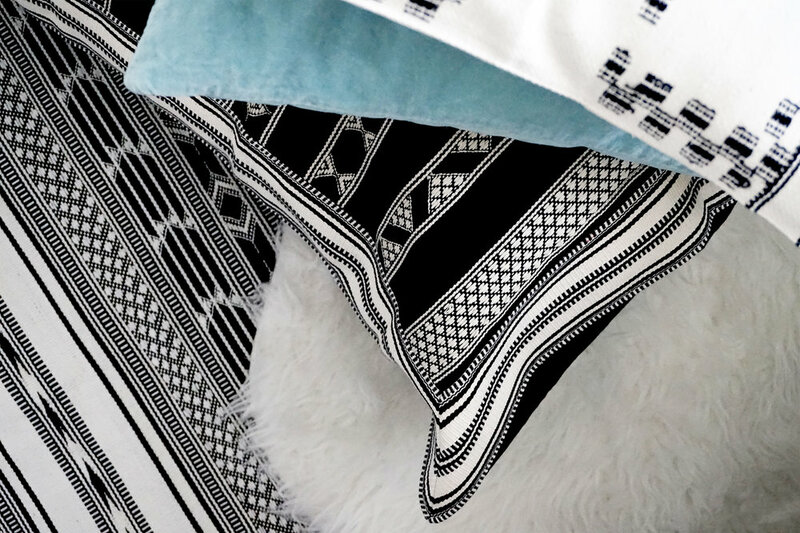 With the black and white tribal trend going strong this year, our collection features black and ivory throws and cushions that have a softer monochrome look. With lots of geometric patterns and natural woven elements, this look lends itself to minimal sophistication that adds drama to tonal colour scheme. Available with ivory fringing or black fringing. Drape a throw over the arm of a grey sofa, place diagonally over a corner or spread over the back of the sofa for an instant transformation. Add a couple of our beautiful Oasis handwoven border cushions and throw in some pops of plain mustard or blue to soften the overall look. Alternatively brighten a children’s bedroom by layering the throw as a rug to add a playful textile influence that’s hardwearing and easy to clean. Looking to spruce up an old, tired room? Add a few cushions! Available in two sizes - 24’ x 24’ or 18’ x18’, our large and regular cushions pull together and harmonise all the elements of a room, bringing order to a busy living space or restoring calm to a messy bedroom. Handwoven by artisans, our cushions take you on a journey of global eclecticism. Featuring rugged textures symbolising the authentic, handcrafted style of this nomadic trend, you can mix and match our collection of cozy cushions easily to create your own authentic look. If looking to revive a tired sofa, then disguising an old sofa with lots of cushions is a great way of literally minimising its impact on the room. Mix and match lots of cushions, add a throw and for a less busy look, arrange monochromatic cushions neatly with throws spread over corners or arms. If you're inspired, head over to the homeware section below and shop the collection. Cushions can be ordered in pair or as singles. Any questions, do get in touch and remember it’s free shipping!